Earlier this year, I had the privilege of teaching a class on building your first Leaflet.js map at the NICAR conference. I just realized I forgot to post the code in this blog so I figured I’d post it now. Better later than never. If you’re interested in building your first map, check out my Github repo for the presentation. Without a doubt, there is an abundance of resources online for programmers and non-programers alike to learn to code. This, of course, is great news for journalists like us who are looking to use programming to make visualizations, scrape websites or simply pick up a new skill. Is 2012 the year of code? 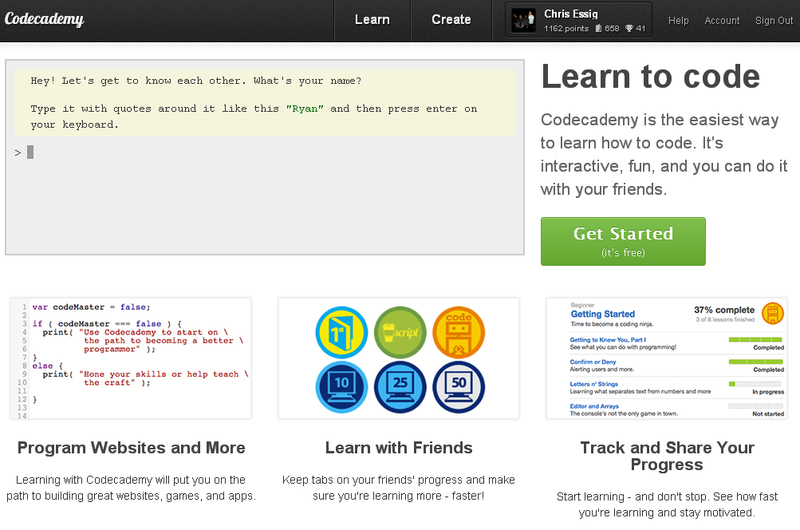 The startup service Codecademy sure thinks it is. They have made it their mission to teach every one who is willing how to code within one year. The idea was so intriguing that the New York Times ran a front page story (at least online) on it. If you are a huge nerd like me, you’ll gladly spend your free time completing the courses. Want to take courses from Stanford University, Princeton University, University of Michigan and University of Pennsylvania for free? Yeah, I didn’t really think it was possible either until I found Coursera, which offers a wide variety of courses in computer science and other topics. Right now, I am enrolled in Computer Science 101, which is a six-week course that focuses on learning the basics. Each week, you are e-mailed about an hour of video lectures, as well as exercises based on those lectures. There is also a discussion forum so you can meet your peers. This isn’t nearly as time consuming as Codecademy is, which might be appealing to some. Like Coursesra, Udacity offers a number of computer science classes on beginner, intermediate and advanced topics. The classes are also based on video lectures put together by some very, very smart people. I have not used this service, however, so I can’t speak to it too much. It looks promising though. And who wouldn’t want to learn how to program a robotic car? If you are looking for screencasts but are on a tighter budget, check out PeepCode and their list of programming screencasts. Each are about $12, are downloadable and typically include source code for the programs to help you follow along at home. One of my favorites is “Meet the Command Line,” which will get you started with the Unix Command Line. Be warned though because some of their screencasts are geared towards more advanced users. A good understanding of programming is recommended before diving into some of these (An exception is the command line tutorial mentioned above). Many of the tutorials on this site are geared towards programmers wanting to learn very specific things or solve specific problems. This tutorial, for instance, runs through how to make borders in CSS. And this one deals with the Command Line text editor called Vim. So if you have a particular problem but don’t have a ton of time to sit through video tutorials, you might want to check out this site’s extensive catalog. Web scraping is a great skill for journalists to have because it can help us pull a large amount of information from websites in a matter of seconds. If you are looking for a place to start, check out some of the screencasts offered by ScraperWiki, a service that specializes in — you guessed it — web scraping. The number of blogs out there devoted to coding and programming is both vast and impressive. Two of my favorite are Life and Code and Baby Steps in Data Journalism. Both are geared towards journalists. In fact, many of the sites I listed here were initially posted on one of these blogs. – Got a cool website that has helped you out?